As mentioned in my first post on 608.2b, many cards have been worded in a way that assumes they will be countered if they have no legal target. Afterlife destroys a creature and gives them a spirit. The clear implication from the name, the art and the effect, is that the spirit should not be there if the creature doesn't actually die. Because Afterlife prevents regeneration, at the time it was printed the only way to stop the creature from dying would have been to make it an illegal target, that would stop the destruction and the rising of the spirit. But if you cast it on a Darksteel Colossus, somehow a spirit emerges from the horrific hulk while it keeps on chugging along. I'll talk a little bit more about these cards, which I'm going to call "Missing If" cards in a future post. What I want to talk about now, is cases where it is plainly obvious that things just aren't right when applying 608.2b. As a side note, you might notice that my examples of cards seem to start with A. That's because I started with the A's. Arbalest Elite has a clear flavour: they've got an arbalest. An arbalest is a huge crossbow that is very slow to reload. So you can fire the arbalest for big damage to an attacker or blocker - a well established "archer" effect - but the elite doesn't untap the next upkeep because they have to reload. In flavour terms, if you fire the arbalest at a creature that then gets selected for inspection, say, the bolt from the arbalest would miss. Strangely, missing allows the elite to reload considerably faster. Ashes to Ashes falls into another category of cards that works in a very odd way. It has two targets and causes you to lose five life on resolution. If you reduce two creatures to ash, the spell extracts five life from you. If you instead reduce only one creature to ash, because on target went missing, the spell still extracts five life from you. But if you reduce no creatures to ash the you are fine. If paying five life were part of the cost of playing the spell, this would have the more intuitive result of the spell demanding five life regardless. There are two mechanics in particular that make stand out to me as having bizarre interactions with this rule: Entwine and Fuse. If I cast Abuna's Chant, I can choose to simply gain 5 life. There are no targets and the spell resolves just fine. Alternatively I can cast it to prevent the next 5 damage that would be dealt to target. Obviously if the target isn't there then the damage is prevented, but that would happen whether we had rule 608.2b anyway. If you entwine, however, then the life gain is dependent upon the target existing upon resolution. The reverse is not true. If your opponent has a Forsaken Wastes, you can still prevent the damage despite the fact that the lifegain part is prevented. Abuna's chant is even stranger, if the damage prevention is prevented from happening by a Flaring Pain then the the lifegain still happens. Sure, that's because of the weird way damage prevention works, but the point is that entwining didn't link the effects in any general sense, only in the specific now-you-might-not-gain-life-for-no-reason sense. If we look more broadly at entwine spells, we see ones with no target and ones where both halves target meaning that there is no link between the two halves. But when one half targets, the other half becomes mysterious counterable. Fuse is, unsurprisingly the same. Entering becomes contingent on Breaking when the spells are fused without the reverse being true, and neither Armed nor Dangerous depends on the other when fused. Another mechanic that seem clearly out of flavour when countered from my perspective was putting eldrazi spawn or scions into play. Abstruse Interference doesn't give any hint that somehow interfering with the spell allowed you to summon an eldrazi scion - you get the scion whether they pay or not. Adverse Conditions is a really bizarre example. You didn't have to select any targets in the first place, so obviously the spell can summon a the token regardless of the targets. But if you selected a target the scion might not show up. If you selected two targets then you are back into the issue we had with Ashes to Ashes - missing half the targets doesn't affect the magnitude of the other effect, but missing all targets causes it to fail completely. I think there are several other mechanics that are improved by this change too, but they are at least a little bit arguable. 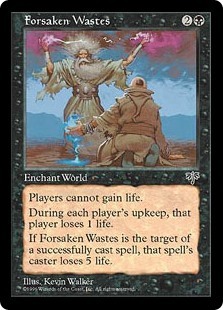 In that category I'd include spells that have Bolster, Scry or life gain tacked onto the end; cantrips; spells with buyback or rebound and the couple of spells that suspend themselves as part of their effect. Going through the A's, overall, I found that of the spells that would actually be affected by removing the counter-on-no-target rule, about 55% seem like their flavour would be improved. Next time I write about this, I'll talk about the misses.